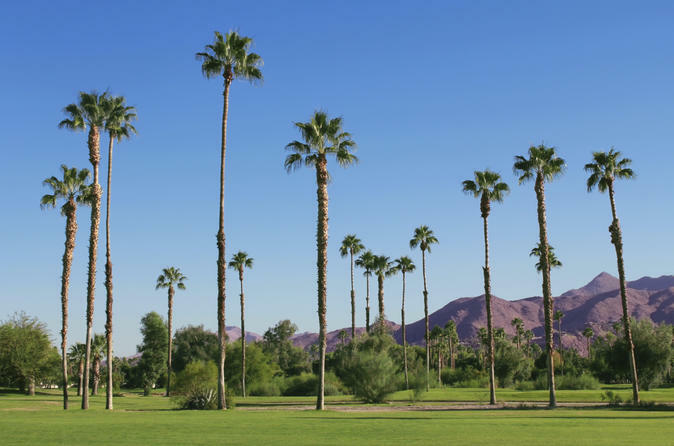 Experience the best of Palm Springs on this day trip from Los Angeles by air-conditioned coach. Enjoy spectacular views aboard the Palm Springs Aerial Tramway and explore Living Desert Zoo and Gardens to appreciate the beauty of the world’s deserts. Pass celebrity homes in El Paseo, known as the Rodeo Drive of Palm Desert, and then enjoy free time to shop at Desert Hills Premium Outlets, where you can snag great bargains on your favorite designer brands. Early-morning pickup is available at the Los Angeles Farmers Market or the Four Points by Sheraton in Culver City. Once you’ve boarded your comfortable air-conditioned coach, relax on the approximate 120-mile (193-km) drive east to Palm Springs. When you arrive, take a narrated city tour to learn about this luxurious desert city. Pass numerous golf courses and learn about famous celebrities, such as Elvis Presley, Frank Sinatra, Marilyn Monroe and Barbara Streisand, who have called this place home. The highlight of your time in Palm Springs is your ride aboard the Palm Springs Aerial Tramway, which gives you amazing aerial views of the city and sprawling desert below, as well as the sheer cliffs of Chino Canyon. After your ride, visit Living Desert Zoo and Gardens, a public desert botanical garden and zoo where you’ll experience first-hand how vibrant and alive the world's deserts really are. See animals from deserts around the world such as giraffes, zebras, mountain lions and coyotes, as well as lesser-known animals such as the Fennec fox with its distinctive large ears which serve to dissipate heat. Back aboard the coach, make your way to El Paseo, known as the Rodeo Drive of Palm Desert. Break for lunch in this upscale shopping district (own expense) before driving past homes of Hollywood stars that are scattered throughout the valley. Finally, arrive at Desert Hills Premium Outlets for some free time to shop. Snag great bargains on your favorite designers as you browse some of the 130 brand-name stores including Coach, Dolce & Gabbana, Gucci, Jimmy Choo, Last Call by Nieman Marcus, Polo Ralph Lauren, Prada and Versace. Once you’ve had your fill of shopping, relax on the drive back to Los Angeles. Special Offer - Book and travel by September 30 and save 14% off our previously offered price! - Book Now!